It was a damp morning in late February 2008 when the phone rang. Harvard scholar and PBS host Henry Louis “Skip” Gates, Jr. was calling with one of his random genealogical requests. He was going to be on The Colbert Report later that day. Did I, by any chance, know anything about Stephen Colbert’s roots? Luckily for him, I had two hundred years of family history at the ready. Unnaturally obsessed with the ancestry of my fellow Irish Americans, I had already snooped into Stephen Tyrone Colbert’s past and discovered that he was about as Hibernian as they come. Fifteen of his 16 great-great-grandparents were either born in Ireland or of Irish heritage, and rather remarkably, their descendants continued to marry only with other Irish Americans for three generations until Stephen himself slightly disrupted the flow when he wed Evelyn “Evie” McGee. Several weeks after Gates’s call, my nosiness was rewarded when I woke up to the best St. Patrick’s Day gift possible – an email from Stephen thanking me and remarking that he was “thrilled to hear we are pretty much pure Irish.” Fortunately for all of us, this should-be poster child for Irish Americans has recently been anointed as David Letterman’s heir apparent and will take over The Late Show in September. Though many will mourn the loss of Colbert, we will now be able to mellow out each evening with the man himself, rather than the character he has portrayed since 2005. And as anyone who’s ever met Colbert will attest, the real man is brilliant, quick-witted, multi-talented, family-oriented, devout, and kind. 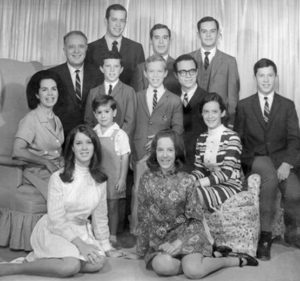 So what sort of family tree produces a Stephen Colbert? Geographically concentrated in New York and Illinois upon arrival in America (in some instances, after a brief interval in Canada), the opposite is true in Ireland where all four provinces can lay claim to a piece of Stephen’s past. So dense and deep is his Irishness that I have little choice but to share it in digest form in order to give a short, yet fairly comprehensive tour of his ancestral map. To that end, I’ll focus on the immigrant generation, who mostly emigrated between the 1820s and 1860s, and provide a brief sketch of each pair of his great-great-grandparents. As you peruse these eight clusters, don’t be surprised if you notice some family patterns. Family resemblance? (from left to right): Stephen T. Colbert, father James W. Colbert, uncle Andrew E. Tuck, grandfather Andrew E. Tuck, great-grandfather John C. Fee, and great-great-grandfather Patrick Connolly. Since we usually have the greatest interest in the surname we start out with, it’s a Murphy’s Law corollary that Colbert is the most mysterious branch in Stephen’s pedigree. It’s also a geographic exception with a third great-grandfather named Anthony, born in the 1790s, who settled in Shepherdstown in what was then Virginia. His descendants would swiftly scatter to Indiana, Illinois, Missouri, Nebraska, and California with Stephen’s line opting for the Land of Lincoln. Though stories have floated down through the generations of a possible French origin for the Colbert name, the few paper trail indications that exist all point to Ireland, including the marriage record of Stephen’s future great-grandfather, George William Colbert, that notes his race as Irish. Family lore also holds that George converted to Catholicism in order to marry Angeline Garin, an event which is said to have provoked a cross-burning in their yard. The tale relates that George calmed his new bride saying, “Let it burn. It sheds a lovely light.” While it’s not been possible to verify the incident, the dual-religion aspect rings true as George’s parents were married in the Lutheran church – perhaps because of his mother, Susan Ann Fletcher, who introduced the only non-Irish ancestry into the mix, a combination of German and English. Marriage license recording George W. Colbert’s race as Irish. George Colbert’s bride, Angeline Garin, was born in Carrollton, Illinois to immigrants Michael Garin and Bridget Caffery. Given that both Michael and Bridget, along with some of their parents and siblings, had crossed the Atlantic in the 1850s, the Famine was undoubtedly a driving factor in their decision to emigrate. The couple married around 1868 and settled amidst a cluster of family members in the Illinois counties of Greene and Macoupin. registries revealed that Michael’s parents, Michael Gearon and Johanna Nicholson, had married on January 29, 1834 in Limerick. Regrettably, the picture is hazier for Michael’s wife, Bridget Caffery, as documents pertaining to her family contradict themselves and mention both Dublin and Belfast. Yet another pair of great-great-grandparents who decided to keep their secrets to themselves is John Tormey and Honora Manning. In fact, the few traces they left make it unclear whether they were born in Ireland or New York. All that is reasonably certain is that they had a son, Henry John Tormey, born between 1862 and 1866 in Staten Island. A couple that may be them appears in Castleton, New York in the 1860 census, but then the trail fades. It might have helped if their son had stayed put, but working as a railroad conductor, he bounced around from Staten Island to Port Jervis to Jersey City and finally to the Bronx. It’s lucky for Stephen that Henry was a wanderer, though, because it was in Port Jervis that he met his future wife, Maggie McCrory. Baptism form (in Latin) of daughter of John and Margaret Tormey that shows her parents’ birth places of Staten Island and Hibernia. 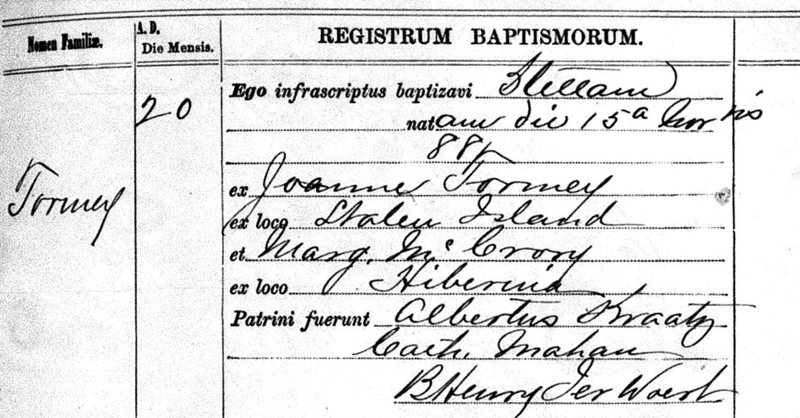 While there is a Tyrone connection way back in the mists of time (see p. 62), the more immediate link is to Belfast where Henry “McRory” and Margaret “McReesh” were considerate enough to leave a critical clue for future generations by marrying in the Catholic Parish of St. Patrick, which has sacramental registers dating back to 1798. The McCrory-McCreash nuptials took place on October 8, 1842. Shifting gears from Stephen’s paternal ancestry to his mother’s side, more is known about the Tuck portion of his family tree than any other thanks to memoirs left by his great-grandfather Andrew Tuck (1833-1917). Andrew wrote at length about the challenging start to his parents’ North American experience. John Tuck and Judith (aka Julia) Dunn married in 1817 in what was then Queen’s County and is now County Laois. More specifically, John was from Ballyhorahan and Judith from nearby Camross. In the 1820s, John journeyed to Canada while Judith stayed behind with several children. The intention was for him to save money and return to Ireland to bring his wife and children back with him, but he made the mistake of turning over his earnings to his employer for safe-keeping. When the employer got into financial difficulties, John was left empty-handed and separated from his family. Andrew Tuck’s memoirs go on to share details about walking to school (seven fences to cross if you took the short-cut and snow that caked up under your heels, crowding your feet out of your shoes), his family (including the birth of each child and the loss of a son to typhoid fever), his land purchases and building endeavors over the years (transaction by transaction, and decisions as minute as opting for a railing on a back stairway), his politics (“I was something of a political curiosity – an Irishman, a Republican”), his views on slavery and pride in voting for Lincoln (“It required courage, confidence and firmness”), and just about everything a curious descendant might hope for. Andrew Tuck was fortunate enough to marry a woman he greatly admired named Maria Lynch. Maria was one of at least seven children of Thomas Lynch and Bridget Rowan, and like the Tuck-Dunns, her family had back-doored into upstate New York through Canada. From Smiths Falls, Ontario, they had moved to Ogdensburg and later Lisbon, New York. It was this event that led the now-elderly Lynch immigrants to make one last move to Illinois where they would spend their twilight years with several of their children who were living in the Chicago area. And it was the death certificate of one of their sons that would furnish the only hint of their origins in Ireland – a frustratingly vague designation of Connaught. The Fee line is another one that left a generous paper trail, mainly because of their business interests. Owen Fee, who would marry Margaret McMahon in the late-1830s, was originally from County Monaghan, where tithe applotment books include a man of his name in the townland of Drumaconvern about a decade earlier. His bride is believed to have been from Cootehill in the neighboring county of Cavan. Owen emigrated in March 1835 and filed his intent to become a citizen in Rochester, New York in 1837. He worked as a butcher there, but passed away unexpectedly in 1855, leaving his widow Margaret with five children, the youngest of whom was only four. Margaret continued to run the family business as a grocery until her oldest son converted it to a saloon and deli in the early 1860s. Assessment lists from 1863 show Margaret being taxed as a “retail liquor dealer,” but it was that same year that her sons formally launched Fee Brothers which is still operating – and owned by cousins of Stephen’s – today. The company evolved over time, adapting to circumstances as necessary. During Prohibition, for instance, it became a supplier of sacramental, “standard altar” wines, which seems appropriate since two of the founding brothers, including Stephen’s great-grandfather John C. Fee, were among the first altar boys when St. Bridget’s Church was established in Rochester in 1854. Today Fee Brothers offers a variety of cocktail mixes, bitters and cordial syrups, and sports a logo which portrays the four brothers along with the slogan, “Don’t squeeze, use Fee’s” (left). Rounding out Stephen’s eight pairs of great-great-grandparents are Patrick Connolly and Elizabeth Maloy. When Patrick made his way as a teenager from Knockaturly in County Monaghan to Roch-ester, New York in 1834, he was taking the first step toward building a new life as a successful merchant – initially in candles with his brother, James, and later specializing in “lace and fancy goods.” About the same year he crossed the ocean, his future wife was born in Rochester to Charles and Margaret Maloy who had emigrated from Kings County (now County Offaly) in the 1820s. Patrick and Margaret had one son and eight daughters. Two daughters died young and two dedicated themselves to the Sisters of Charity, serving in hospitals and orphanages. Their third child, Carolina, would eventually marry John C. Fee, joining two prosperous, Rochester families. It says something of the Connollys that when Patrick passed away, school books were among the first possessions specified in his estate papers to be held in reserve for his family. All of this sprawling heritage was funneled to Stephen by way of his mostly second-generation great-grandparents, striving grandparents, and over-achieving parents. His father, in particular, was a man of singular accomplishment. Having acquired his medical training and skills at Columbia and Yale, James William Colbert, Jr., M.D., served with the U.S. Army’s Medical Corps and as Assistant Dean of the Yale University School of Medicine, before becoming, at 32, the youngest person to hold the deanship of a medical school (at St. Louis). He later moved to the National Institute of Health, and then to the Medical University of South Carolina. Along the way, he still found time to serve on a number of health and medical boards, and as co-chairman of Doctors for Kennedy during the 1960 Presidential campaign. 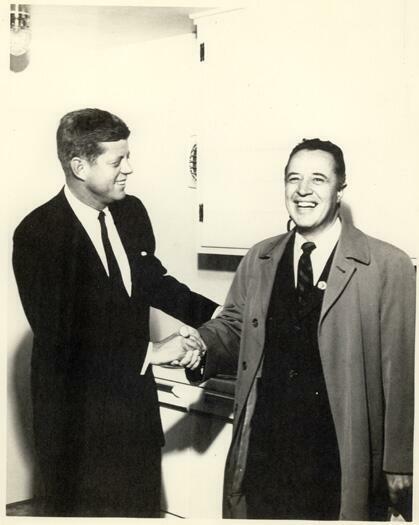 John F. Kennedy and James W. Colbert, Jr., M.D. in 1960. Young Stephen (in jumper) with his parents and ten older siblings, 1968. The remarkable women of Stephen Colbert’s family tree (left to right): wife Evelyn McGee-Colbert, mother Lorna (Tuck) Colbert, grandmothers Marie (Fee) Tuck and Mary (Tormey) Colbert, great-grandmother Carolina (Connolly) Fee, and great-great-grandmother Elizabeth (Maloy) Connolly. The Late Show with Stephen Colbert premiers September 8th. Megan Smolenyak is a genealogist and the author of six books, including Trace Your Roots with DNA and Who Do You Think You Are?, a companion to the TV series. She has uncovered the Irish heritage of everyone from Barack Obama (3%) to Barry Manilow (25%), and focuses her attention on Stephen Colbert (94%) in this issue. Read Sheila Langan’s 2013 profile of Smolenyak here. My Father’s family came to Kansas City, Mo from Ireland, I never knew any of them, but sure wish I had!!! My Father was a wonderful man but died at the age 38. Stephen and I share the same great-great-great grandparents in Michael and Bridget Garin. I live in the very close vicinity of where I believe their property was located in Chesterfield, IL and to where they and George W Colbert and daughter Anna are buried. We know so little regarding Michael and Bridget aside from one photograph. I have always longed to know more about them, where they arrived from, etc. Could you please assist me in learning about them or some sources I have scoured online, local historical societies, etc not coming up with much info. Any help would be appreciated… Thank you. I am the one who discovered where the Guerin’s wher married. confused on marriage date of Michael and Johanna as 1834 since Michael Garin my gr-gr-gr grandfather was born in 1831 is Johanna his mother?? born prior to marriage? wondered about this. I have found Michael and Bridget in the Macoupin Co IL census 1860, have heard conflicting reports on their marriage year so will be cking with county clerk for copy if available. Breanne, I am Helen Colbert’s granddaughter. Email me…..
Love to share info. Cindy B.
I am Helen Colbert’s granddaughter and grew up in Illinois. Love to share some info.